The number of seriously underwater homeowners dropped significantly in the third quarter of 2015 due to rising home sales volumes and prices. The number of equity rich homeowners went down, at the same time, as more homeowners leveraged their equity and refinanced, traded up or cashed out completely. Only one in three properties in foreclosure was seriously underwater, the lowest level since RealtyTrac began tracking in the Q1 2012 and down from a peak of 62 percent underwater in the second quarter of 2012. 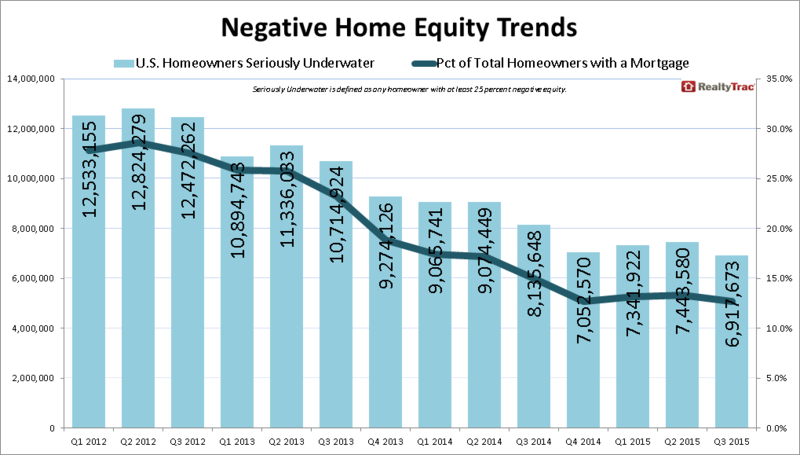 The third quarter of 2015 (Q3) saw a dramatic drop in seriously underwater homeowners and a surge in home sales volumes and prices, according to the Realtytrac U.S. Home Equity & Underwater report for Q3. There were 6.9 million seriously underwater (at least 25 percent underwater) U.S. residential properties at the end of Q3 2015, down more than half a million from the previous quarter and down more than 1.2 million compared to a year ago. “After a lull late last year and early this year, home sales volume and average sales prices picked up dramatically again in the second and third quarters of this year, resulting in a substantial drop in seriously underwater homeowners,” said Daren Blomquist, Vice President at RealtyTrac. People who have owned for five to ten years are most likely to be underwater because they bought in the last bubble, he said. Among residential properties with a mortgage that have been owned between five and 10 years, 17.2 percent are seriously underwater. At the other end of the spectrum, 39.3 percent of homes owned for 20 years or more are equity-rich — the highest equity-rich share of any years-owned range analyzed by RealtyTrac. Meanwhile, in June and July this year, the market saw the highest two months of sales volumes RealtyTrac has seen since August 2006. “It was a real jump,” said Blomquist. “We are seeing inventory loosen up. It all ties together, people are more confident about having more equity, putting their homes up for sale, so there is much more inventory, boosting the number of sales,” he added. Given the current climate, it could be argued, “it’s great time to sell,” he said. “According to our data nationally, people who sold in the third quarter of this year are selling for 15 percent above what they bought for, which is the biggest increase since 2007,” said Blomquist. In hot markets like San Jose, California, this figure rises to 33 percent. The other main change, shown in today’s report, was there were 10.5 million equity-rich (with at least 50 percent equity) U.S. residential properties at the end of the third quarter, down nearly a half million from the second quarter. It seems that more homeowners with equity are leveraging their equity with a refinance, a move-up sale and purchase, or by cashing out of the housing market completely. Refinancing could be happening as home values rise and homeowners feel confident to remodel their homes, said Blomquist. “If not moving up to a bigger home, they will take the equity to do a remodel,” he said. The only concern with people leveraging their equity, he said, is that they are not using their home as an ATM and expecting homes to rise in price and naturally get high growth. “It was just a mistake made in the last housing bubble. But lending restrictions are still pretty tight,” said the RealtyTrac VP.